For my last photo of this mini-Natchez series, I feature a rather unconventional street photograph. About two weeks ago, I talked about how I define street photographs. This one is certainly not on the street, but it does feature people, while aware of me taking the picture, were certainly unprepared for it. I’m actually rather surprised how many people reacted to this picture. It’s hard for me to remember and judge the distance, but I was probably 100 – 150 feet away. I shot this at a 300mm equivalent with my Olympus 14-150mm lens. Yesterday, I talked about shooting with extreme telephotos, and zoomed out full at 150mm, this is a long as this lens gets. While optically better than the Panasonic ZS50 superzoom I mentioned yesterday, it still diminishes in quality at this focal length. The center is decently sharp, but gets softer around the edges. Still, I’m glad I had the option to make a photo like this, even if it’s not optically ideal. It’s something that’s different from my usual candid street photos. Without context, most people would be hard pressed to figure out where this is, though telltale signs, like the reference to the life-preserver, hints. 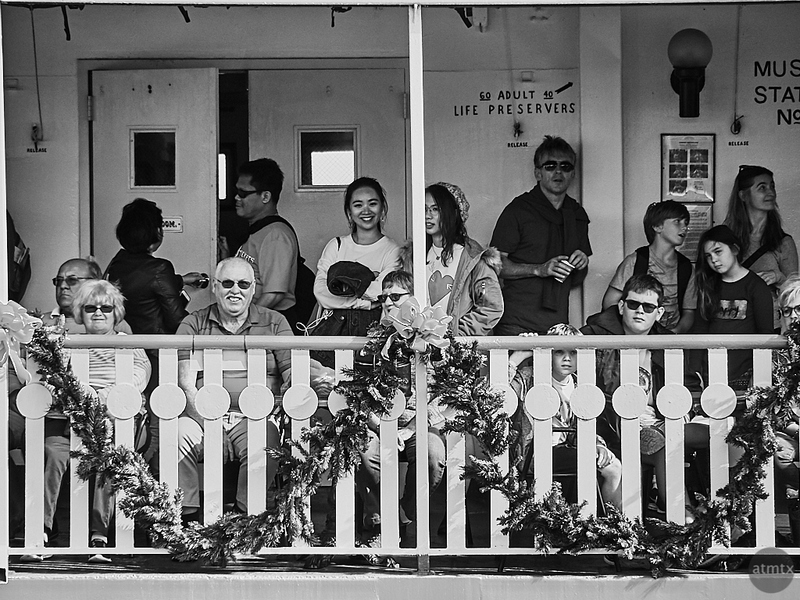 I think it rounds out the Natchez story, ranging from my first photo which was a wide-angle, to this closeup of the passengers.